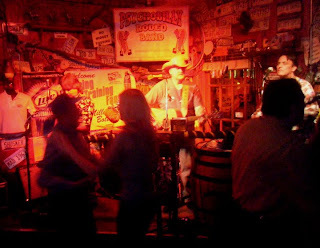 The Rusty Spur is a fairly genuine honky tonk in the middle of Old Town Scottsdale. It's in a structure built in 1921 and became a saloon back in1958 (claiming to be the oldest Saloon in Scottsdale). It serves as "the destination of choice for the Hashknife Pony Express riders after completing the 200 mile relay ride over the grueling, mountainous trail from Holbrook to Scottsdale." The house band -- the Psychobilly Rodeo Band -- told the audience "It's kinda crowded tonight, so if you're not gonna tip, we'd appreciate it if you got your cheap asses outta here."